TTW’s Sustainable Food group held their annual community apple juicing session on Saturday 13th October, open to the general public, and although there were fears about the weather after Storm Callum had blown through the night before, by 1pm the sun was shining. Around 20 people came along, some bringing apples and some not, but there were plenty to go around. There weren’t very many left at Swains’ Lane nature reserve this year, as the apples had mostly been picked this summer due to the popularity of the new TTW foraging map. Some people kept their apples separate to taste the different juices, and others were mixed together. An eating apple makes a much sweeter juice, whereas cooking apples are tarter, so a blend can be delicious. Everyone got stuck in and helped chop, work the apple pulping machine, or twisted the press. The hand-driven machines are remarkably effective, and many bottles were produced in the two hours by just two presses. Apple juice is an ideal product to make from windfall apples (of which there were many after the storm) as these will not store. The juice produced was taken home by everyone to either drink fresh, freeze, to make cider for those who knew how, or to home pasteurise. The press is for the community, so if anyone wants to borrow it then contact Kate on 01823 667170. It was a lovely afternoon with a friendly fun atmosphere, showing what great community spirit we have here in Wellington. The TTW offshoot group met for the third time on Friday 29th June, to continue with the maintenance of the community fruit patches planted in Wellington. This month we met at the community woodland behind the sports centre. Helen arrived first and started to tentatively scythe some 6ft tall stinging nettles that had surrounded a plum tree. Once everyone else arrived, we split into groups to do different tasks; Anita, Holly and Ann pruned the plum, sweet cherry, greengage and quince trees. Viv, Marcie and Helen tackled the blueberries, pulling up grasses that were encroaching on the bush surround, and Helen scything one last patch of grass that uncovered another 3 bushes. Holly and Anita then tidied the aronias, while Ann joined in helping with the blueberries. It was great to have 6 people all working together to get so much done. We all agreed that, it’s great to have a group that you can join in with when you are free, with no pressure to make it every month if you are busy. We’ve now had 11 different people coming to the group with an average of 5 at each session. This is really encouraging; if the group continues to grow like this, then we should be able to plant more patches of fruit in Wellington, and know we have a team of people to help maintain them. It was also lovely that everyone who came added their different experiences, and were able to work on a task that suited their abilities. Ann for instance, has more experience pruning plums, so was able to tackle a difficult tree with confidence. If you would like to join us next time, we will be meeting on Friday 3rd August, 9-10.30am. I’m not sure where yet, we will decide where needs it most at the Sustainable Food Group meeting tomorrow, so look out for the meeting notes later in the week. On a sunny, hot spring morning, five of us got together at the top of the rugby pitch to look after the fruit trees we'd planted there last year (and the year before). Brambles, nettles, docks and high grass had already been cut down around the trees by our scythe-meister, Andi, the previous evening, so we could immediately access the trees without difficulty. Helen had brought a wheelbarrow full of tools, and was joined by Kate, Hilary, Jane and Anita wielding secateurs, rakes, a couple of saws (rather blunt! Must get 'em sharpened at the next repair cafe!) and a stepladder. We raked up the cut scythed pieces, pruned some overhanging trees, gave the cherry trees a light prune to remove any crossing over and inward pointing branches, and loosened a few ties to prevent rubbing, even removing the stakes that were rubbing on three. We left all the rabbit proof mesh guards on. There were quite a lot of immature green cherries, so hopefully there will be some for us to pick this year. We will post on our Facebook page when they are ripe, so you can pick some yourself. We held another community gardening session on Friday 4th May, 9-10.30am. Between 4 of us from the food group, we maintained the herb bed at Bulford Road, trimming the rosemary and lavender, replanting rosemary, sage and thyme that had died, adding more wood chippings, and getting on top of the weeds! The herbs are starting to become more bushy and look more beautiful now, the rosemary is in flower and the chives are covered in buds. Although unfortunately no new volunteers came along, probably due to a lack of advertising, we did stop and chat to lots of passers by, letting them know that as this is a community herb bed, they can pick herbs for their dinner on their way home. We also encouraged them to pull out a weed every time they passed - if everyone pulled up one weed, then it would stay looking very neat and tidy. We do need new volunteers for the gardening sessions to grow the project further in the future, so if you are interested, the next gardening session will be on Friday June 1st 9am-10.30am at the 2nd Rugby Pitch (see future events). 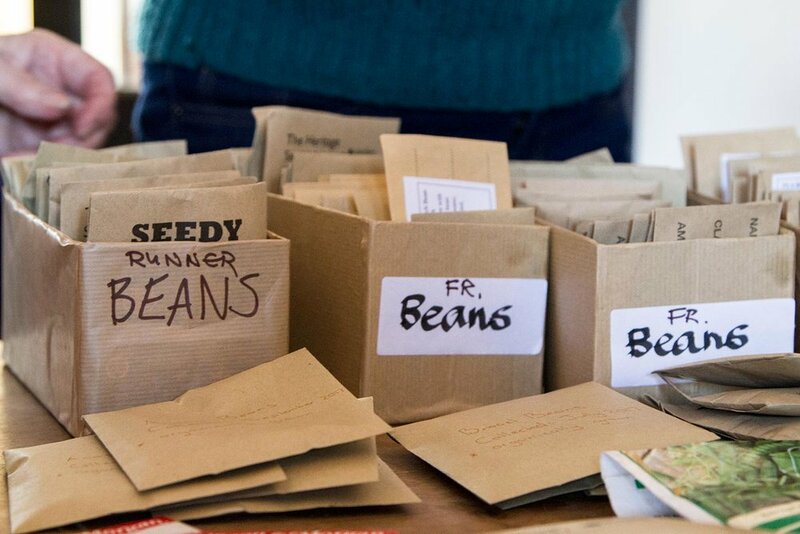 The TTW's fourth annual seed swap was a big success on Sunday 12th February. The Dolphin pub were the perfect hosts again, and over 40 people came through the doors, with at least a third of those being new visitors to the event. We were very pleased to meet new gardeners, two new volunteers interested in joining the Sustainable Food Group, and also heard of a new patch of wasted ground in Wellington, currently brambles, that could home a potential new fruit bed! Many seeds were brought along to swap, both home-saved and shop-bought, we even had some camomile lawn plants! If you missed it this year, we aim to hold it yearly on the second Sunday in February. The TTW's sustainable food group held their annual Christmas cooking and craft event on Saturday at the Methodist church, which was enjoyed by all the visitors. We made beautiful Christmas decorations using wool and ribbons, and enjoyed making (and eating!) mince pies and chocolate truffles The wreath making went especially well this year, due to Brian providing pre mossed rings, with lots of pre cut foliage donated from friends, it was very enjoyable and satisfying to create a beautiful finished piece to take home and hang up! The trial of cranberry sauce versus redcurrant sauce, went very well too, with most reports from the taste test being that people preferred the taste of the redcurrant sauce! That is good news, because redcurrants are locally grown, plus cheaper and a more sustainable alternative. When comparing the cost of using locally picked redcurrants for free (TTW has planted some bushes around town this year for foraging from next summer, or you could always plant one in your back garden!) against shop bought cranberries imported from the USA, the redcurrant sauce cost only 10p per jar, against the cranberry sauce costing 70p per jar! The cranberry sauce is definitely worth making this year though, as making your own is still tastier than shop-bought! Our next event is our "seed swap Sunday" on February 12th, so make sure you gather up those seeds from your garden before the winter! Too many cooks? In this case definitely not. As I arrived late to this year's chutney making day at the Methodist church in Wellington, I found a hive of activity, with pots bubbling hot on the stoves, sending the sweet smell of sugar and vinegar emanating through the hallway, glass jars warming in the ovens and a calm and busy group of people working side by side each taking on different jobs to make this year's successful glut of Chutneys. Five different flavours in all and one Beetroot Relish to boot. Visit our Tumblr website for some of the recipes. And come along to the next one if you want to join in. The community planting project is going well for the Transition Town Wellington's Sustainable Food Group this winter. Lots of volunteers came to help us plant 15 trees and 15 bushes, of 8 different varieties of fruit, at the community woodland on Sunday 21st, and 12 morello cherry trees at the edge of the 2nd rugby pitch on the 14th. They won't produce any fruit this year, but as from 2017, you can just walk down there and pick plums, apples, greengages, and quince. The small bushes will eventually grow 5 feet or more tall and be laden with Aronia, elderberries and blueberries to gather. A great afternoon spent discussing the nature and necessity of fighting food waste at the Waste Not Want Not event on Saturday 30th January. As we all know, food waste is a major issue in the UK. We throw away 7 million tonnes of food and drink from our homes every year, the majority of which could have been eaten. The TTW Food Group shared lots of great tips on transforming your kitchen scraps into edible goodness and showed attendees endless ways to use up bread, the many uses of orange and lemon peels, how apple peels and cores can be turned into apple cider vinegar. We also learnt that expiration dates on supermarket food mean very little and how eyes, noses, and mouths are more trustworthy than any conglomerate’s recommendation. Our next event is Seedy Sunday which is now in its third year and growing every year. It is held upstairs at the Dolphin pub on Waterloo Road on Sunday 14th February from 2-4pm. We will provide a selection of plants and seeds we have gathered, but if you have collected seeds last summer and autumn, the idea is that you bring them to swap. The more people that can join in, the more choice will be there. You can also bring shop bought packets either opened or not, that you have surplus, or any small plants or cuttings. We do suggest not to bring home saved pumpkin or courgette seeds as these cross-pollinate to create a tasteless monster! So do pop in and join us, it is a chance to network with other transition people and to ask any gardening questions. There will be children's activities such as making seed bombs, to help our native wild flowers. If you do not have anything to swap, we will be collecting donations for the Transition Town Wellington, to help us keep running our events, so you can still pick up something for your garden. Hope to see you there!